Lipton varieties suit every mood. Lipton has the varieties that please a range of tastes. Black tea, cloves, natural flavor, soy lecithin. Contains: Soy. 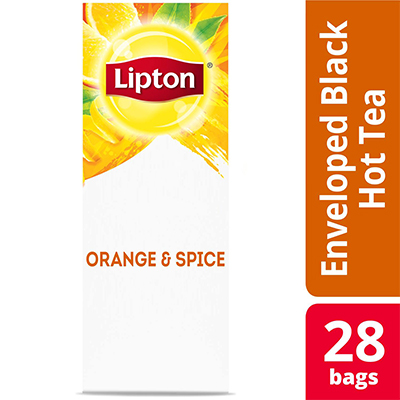 Bring an energizing boost to the workday with Lipton Enveloped Black Tea with Orange and Spice Hot Tea Bags. Featuring a blend of citrus, cloves, and other spices for a tasty kick, this black tea offers an exceptionally pure tea flavor and aroma. These hot tea bags offer an ideal means of keeping employees satisfied and stimulating meaningful connections in the workplace. And thanks to their easy-to-steep design, they allow your colleagues to brew a cup of tea whenever they want. Lipton teas cater perfectly to your employees’ moods and preferences--even as they change throughout the day. Select from a broad offering of delicious office teas to help foster a happier and healthier work environment. For one cup: Infuse one tea bag in freshly boiled water. Brew for 3-5 minutes, based upon desired strength. Remove tea bag and sweeten to taste with honey and sugar.